Please notify the parish office at least six months in advance to schedule a wedding. 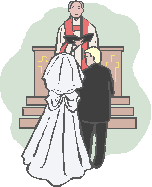 Each couple is required by Archdiocesan guidelines to complete a process of marriage preparation prior to the wedding. The normal presider at the wedding is one of the clergy assigned to our parish. It would be expected that, if both parties are baptized Catholics, that the wedding would take place within the context of a Mass. Normally, there must be some historical connection between one of the parties and our parish in order for a wedding to take place at Nativity. Further, Catholic parties who marry in our parish must give evidence of the practice of the faith.